Read TKAM through Chapter 9 to page 89. Study for Vocabulary Quiz #5 and finish vocabulary squares. Book Reviews due Tuesday, September 30. This is next week! There will be some required book reading for homework this week. I will announce each day in class and you can also look at your class page. Beowulf 2/3rds Quiz during Block Two. Two monsters down and one to go. Early release on Wednesday – students dismissed at 1:45. Homework this week – read 1/2 hour every day! Book Reviews due September 30, 2014. Study for vocabulary quizzes on Wednesday and Thursday. Write sentences that demonstrate your understanding of the vocabulary word. He is rabid. This is a complete sentence but does not show the meaning of the word rabid. A better sentence: The rabid dog bit the child. Read a 1/2 hour each night or a minimum of 2 1/2 hours per week. 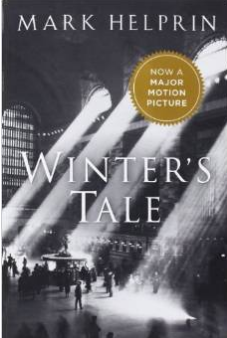 I’m currently reading Winter’s Tale by Mark Helprin.